Visionary eco-architect Vincent Callebaut has just unveiled images of his latest ecological masterpiece and it’s jaw-droppingly stunning. 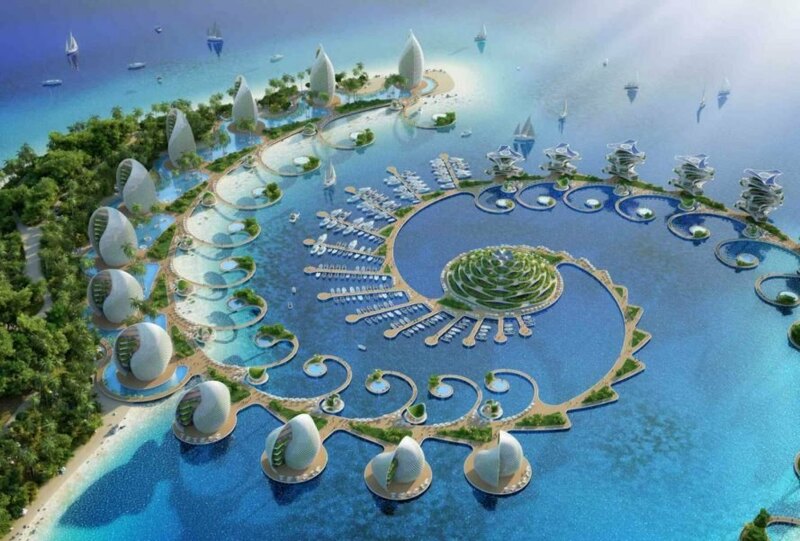 Nautilus is a futuristic 27,000-square-meter eco-resort designed for Palawan, Philippines. 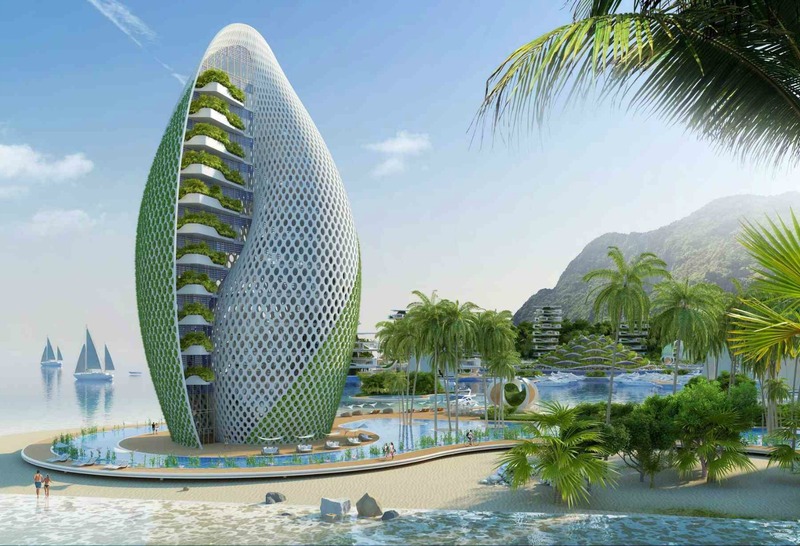 The beautiful self-sustaining complex, which would include various research centers, shell-shaped hotels and rotating apartment towers, is designed to be a shining example of how resilient tourism can allow travelers to discover the world without destroying it. 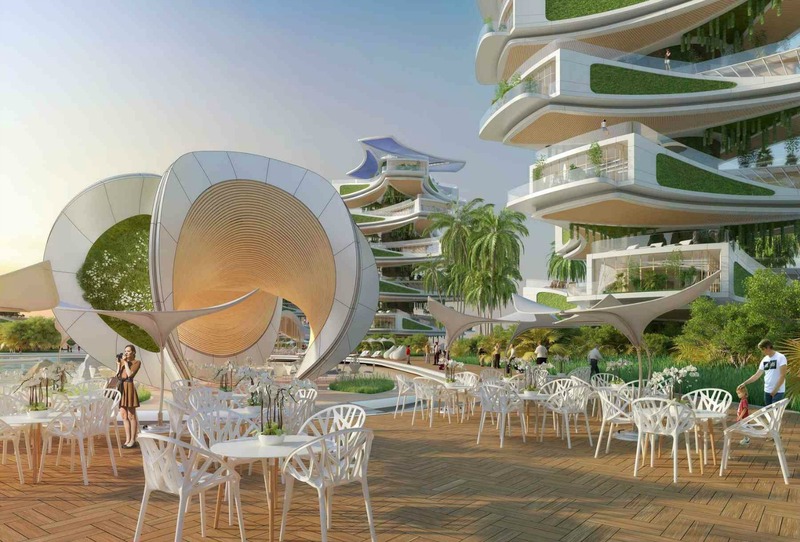 Callebaut designed Nautilus to be a resilient, self-sustaining community that includes a series of rotating apartments and luxury hotels, along with a elementary school and sports center. Also on site would be a scientific research and learning center for travelers who’d like to collaborate with engineers, scientists, and ecologists in actively taking part in improving the local environment. It’s a pioneering collaborative concept focused on using real-world education to foster and spread the idea of responsible ecotourism – or as the architect describes it – “a voluntary approach to reimburse ecological debt”. 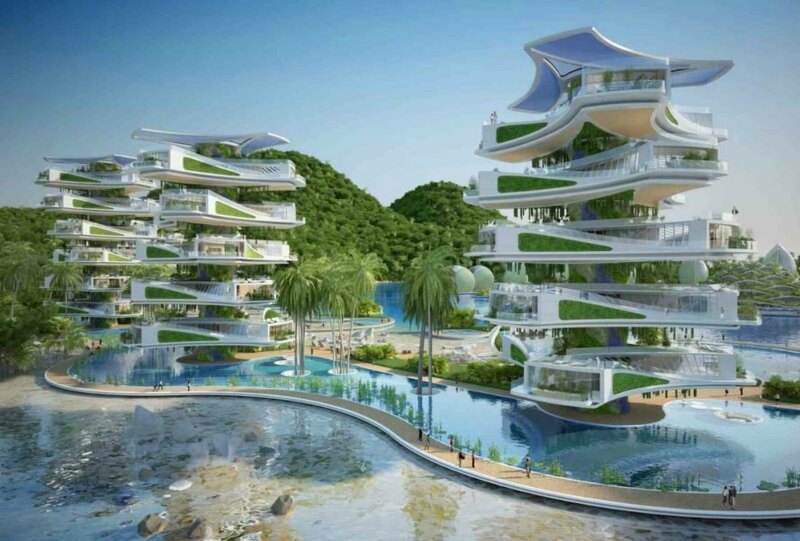 Using the principles of biomimicry, the design is inspired by the “shapes, structures, intelligence of materials and feedback loops that exist in living beings and endemic ecosystems.” The construction and operation of the complex would work under a “zero-emission, zero-waste, zero-poverty” ethos, using 100 percent reused and/or recycled materials from the surrounding area. All of the materials used in the construction would be bio-sourced products derived from vegetable biomass. Microalgae and linseed oil would be used to manufacture organic tiles, while any wood used would be locally-sourced from eco-responsible forests. Even the luxury lodgings would be self-sustaining, playing a strong role in the design’s net-zero energy profile. 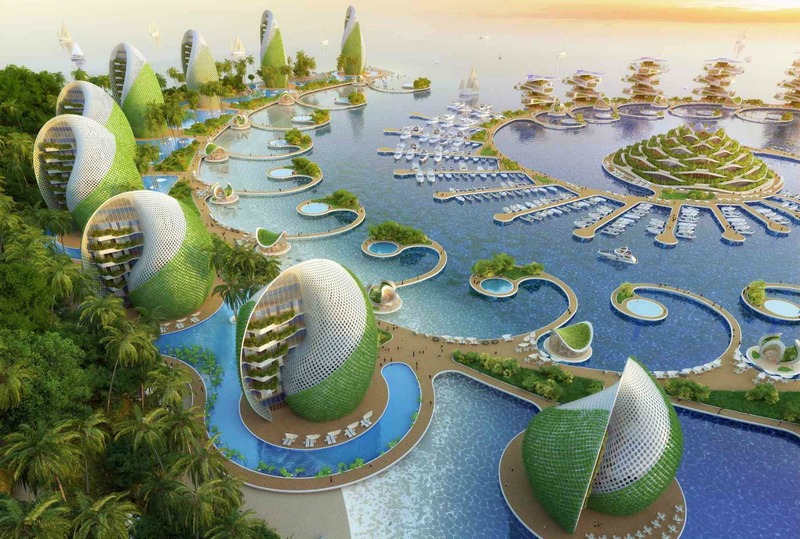 The main tourist village would be built on telescopic piles that produce ocean thermal energy as well as tidal energy. This energy, along with photovoltaic cells, would produce sufficient energy for the the village, which will also be installed with vertical walls and green roofs to increase the buildings’ thermal inertia and optimize natural temperature control. To the west, twelve small spiral towers with a total of 164 units are designed to be built on rotating bases that turn on their axis according to the course of the sun, fully rotating 360 degrees in one day, providing optimal views of the surrounding environment and taking advantage of a full day of natural light. On the east side, the complex would have 12 small snail-shaped “museum-hotels” constructed with recycled concrete. The hotels will feature various exhibition spaces on the bottom floors and guests rooms on the upper floors. At the heart of the resort will be Origami Mountain, slated to house a scientific research center and nautical recreation area. The building would be constructed using a Cross Laminated Timber framework that would be layered to create a number of undulating ramps that fold out like a massive origami structure. Visionary eco-architect Vincent Callebaut has just unveiled images of his latest ecological masterpiece and it's jaw-droppingly stunning. 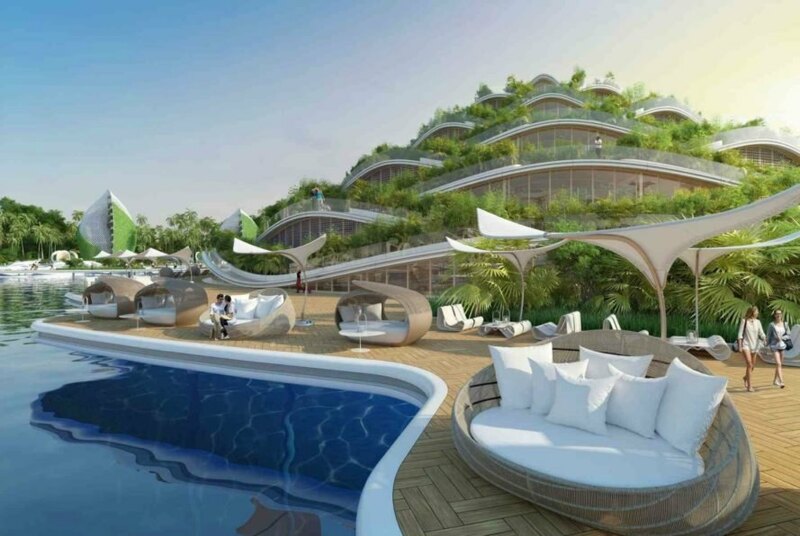 Nautilus is a futuristic 27,000-square-meter eco-resort is slated for Palawan, Philippines. 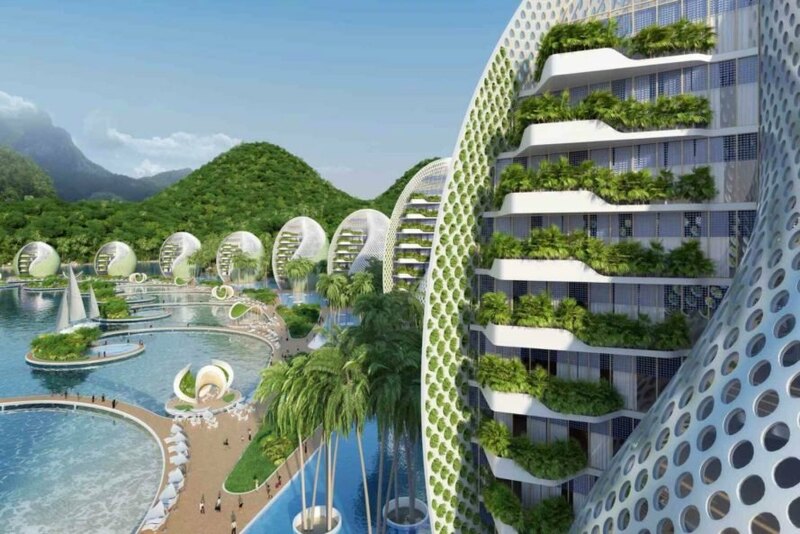 The beautiful self-sustaining complex - which will include various research centers, along with shell-shaped hotels and rotating apartment towers - is designed to be a shining example of the future of how resilient tourism can allow travelers to discover the world without destroying it. 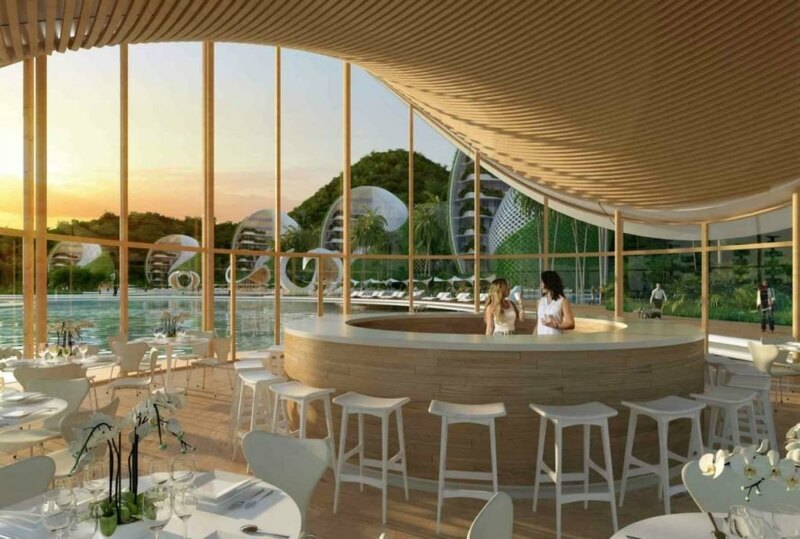 Nautilus is designed to be a resilient self-sustaining community that includes a series of rotating apartments and luxury hotels. The complex will also include a elementary school and sports center. Also on site will be a scientific research and learning center that will be open to travelers who'd like to collaborate with engineers, scientists, and ecologists. Travelers will be able to participate in programs designed to protect the environment. Travelers will actively take part in improving the local environment. Nautilus is a pioneering collaborative concept focused on using real-world education to foster and spread the idea of responsible ecotourism. The architect describes the experience as a voluntary approach to reimburse ecological debt. Using the principles of biomimicry, the design of the resort is inspired by the "shapes, structures, intelligence of materials and feedback loops that exist in living beings and endemic ecosystems." The construction and operation of the complex will work under a "zero-emission, zero-waste, zero-poverty" ethos. The complex will be built using 100% reused and/or recycled materials from the surrounding area. All of the materials used in the construction will be bio-sourced products derived from vegetable biomass, including bi-products from agriculture, wood, and help wool for thermal insulation. Microalgae and linseed oil will be used to manufacture organic tiles and any wood used will be locally sourced from eco-responsible forests. Even the luxury lodgings will be part of the self-sustaining ethos of the complex and will play a strong role in the design's net zero energy profile. The main tourist village will be built on telescopic piles that produce ocean thermal energy as well as tidal energy. This energy, along with photovoltaic cells will produce sufficient energy for the the village, which will also be installed with vertical walls and green roofs to increase the thermal inertia of the building and optimize natural temperature control. To the west of the project, twelve small spiral towers with a total of 164 units will be built on rotating bases that will turn on their axis according to the course of the sun, fully rotating 360 degrees in one day. The design provides optimal views of the surrounding environment and also takes advantage of a full day of natural light. To the east of the project, the complex will have 12 small snail-shaped "museum-hotels" made out of recycled concrete. The hotels will feature various exhibition spaces on the bottom floors and guests rooms on the upper floors. At the heart of the resort will be Origami Mountain, which will house the scientific research center and nautical recreation area. The apartment and guest rooms will feature stunning 360 degree views. The mountain will be constructed using Cross Laminated Timber framework that will have a number of undulating ramps that fold out like a massive origami structure. 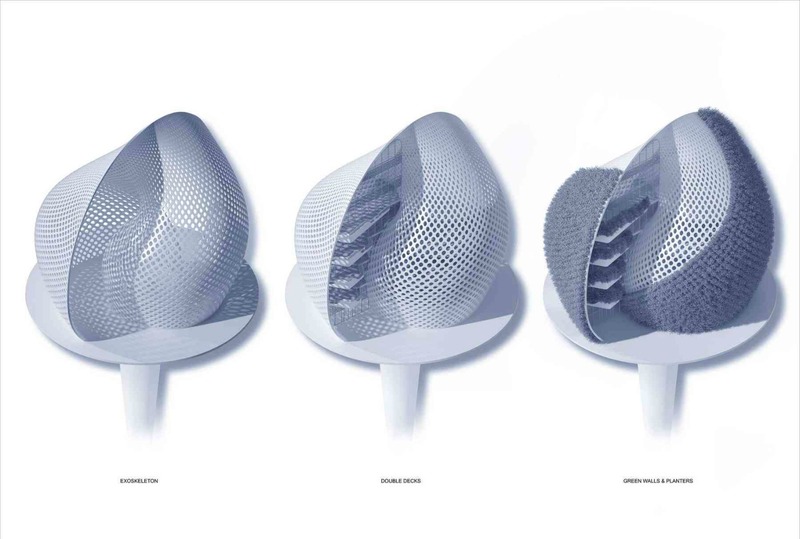 The seashell pods will be constructed out of recycled concrete. 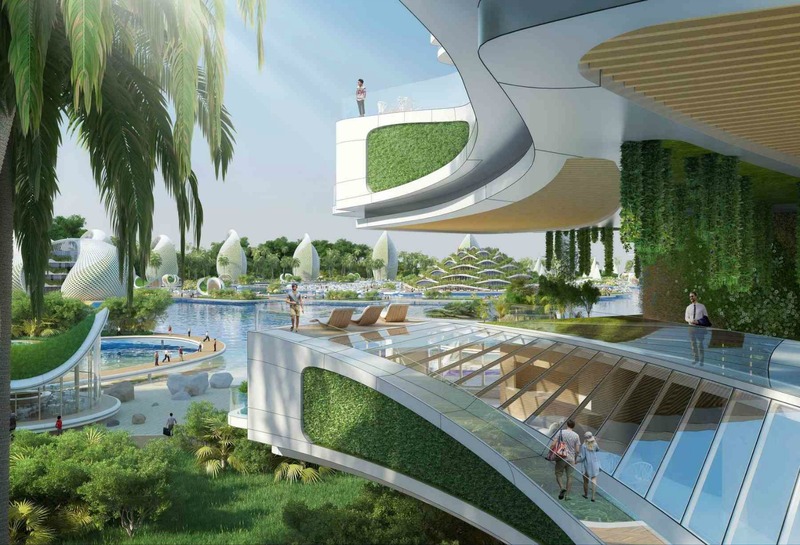 The Nautilus eco resort will be a pioneer in eco tourism. The complex will be built with sustainable materials. 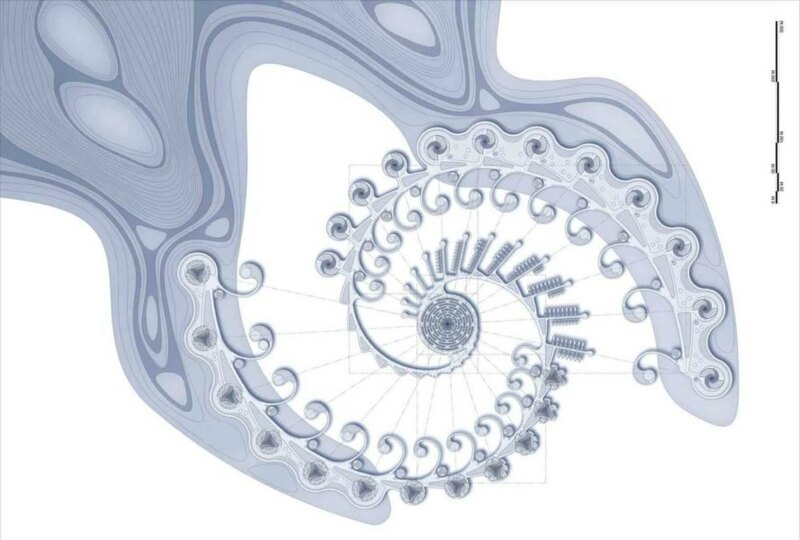 The rotating structures will generate energy. 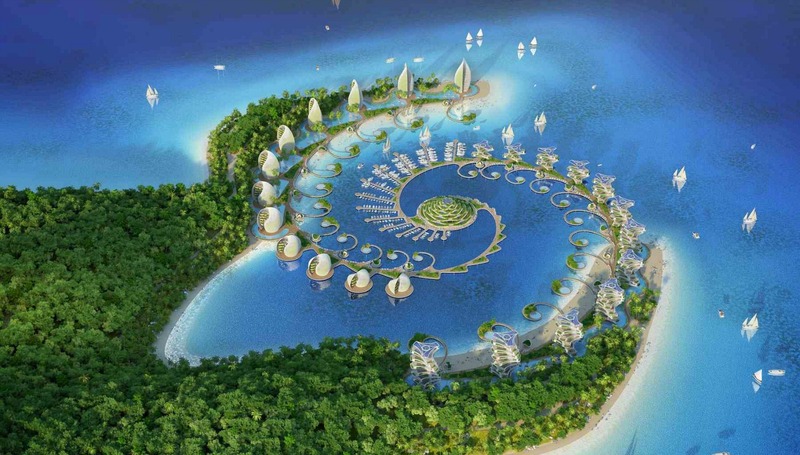 The Nautilus resort will be 100% self sustaining. The heart of the resort will house the research center. 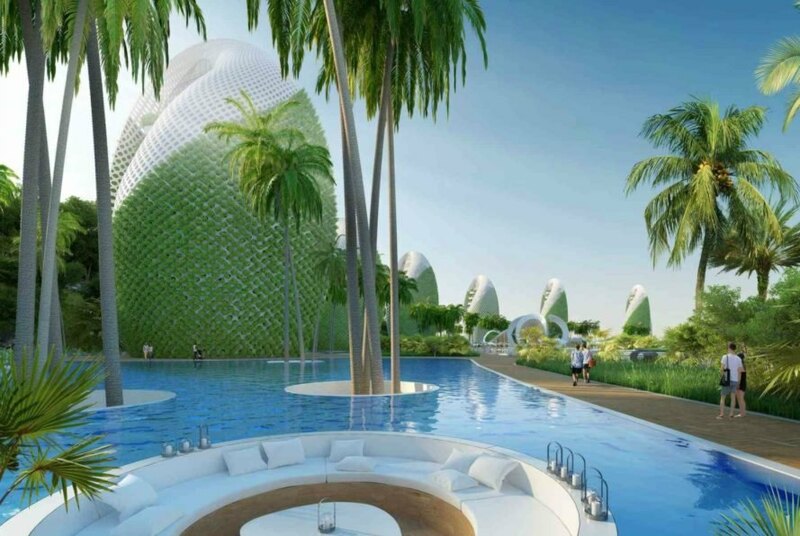 Nautilus Eco-Resort by Vincent Callebaut.